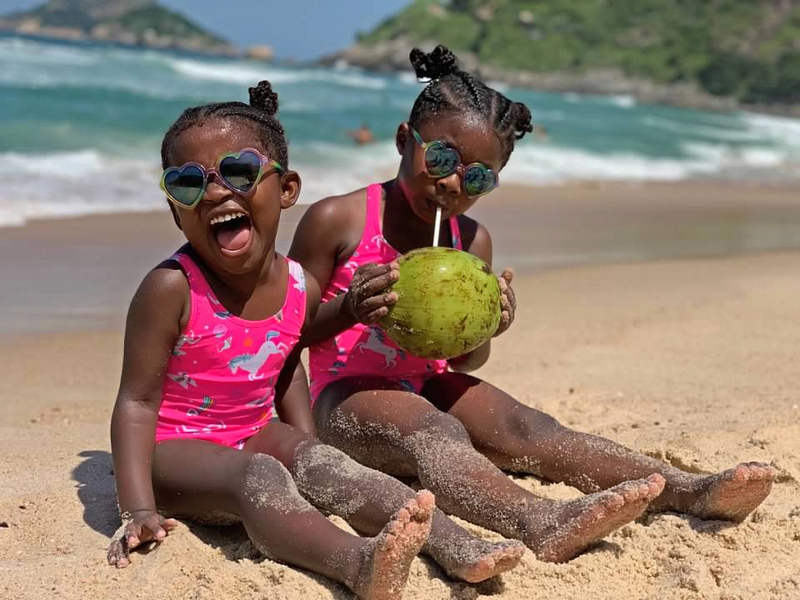 My family went on the perfect Brazil vacation after landing cheap flights to Brazil. And unlike when my parents visited in 2017 the process was smooth thanks to the changes to the Brazil visa for US citizens. Here is our Rio de Janeiro itinerary to help you plan your own perfect Brazil vacation. First it’s important to know Brazil has opposite seasons than the US so our winter is their summer. However, they really only get two seasons, Spring and Summer. The coldest months typically don’t see temps lower than 60 and that’s only at night. Most people say December to March is best weather wise as temps average 85, perfect to hit the beaches of Rio. This also means it’s the most expensive for hotels but that doesn’t mean you can’t get cheap flights to Brazil during these months. June is the rainiest month so steer clear or have tons of indoor activities planned! Don’t forget to consider big events like Carnival when planning your Rio de Janeiro itinerary. You’ll either want to flock to Rio during this time or avoid it depending on what you’re looking for. 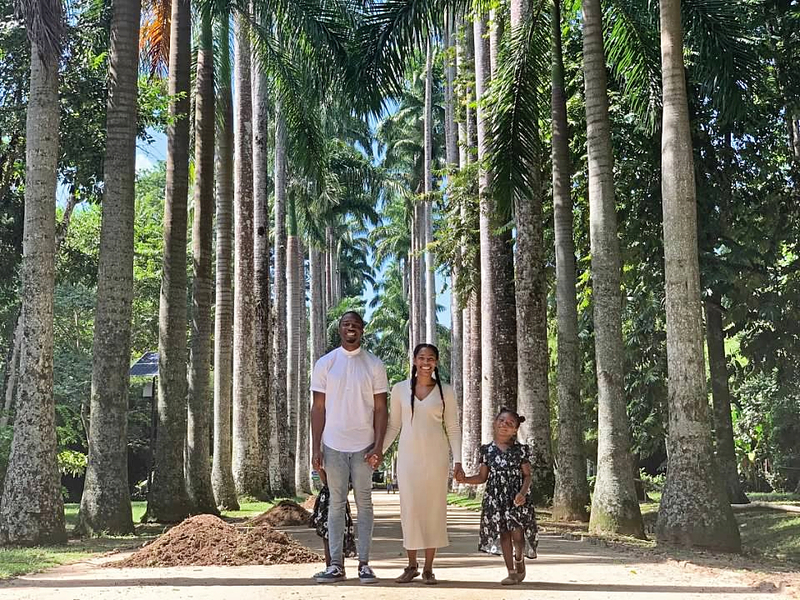 If you’ve been following our family travels for a while you know our travel is based on flight deals. 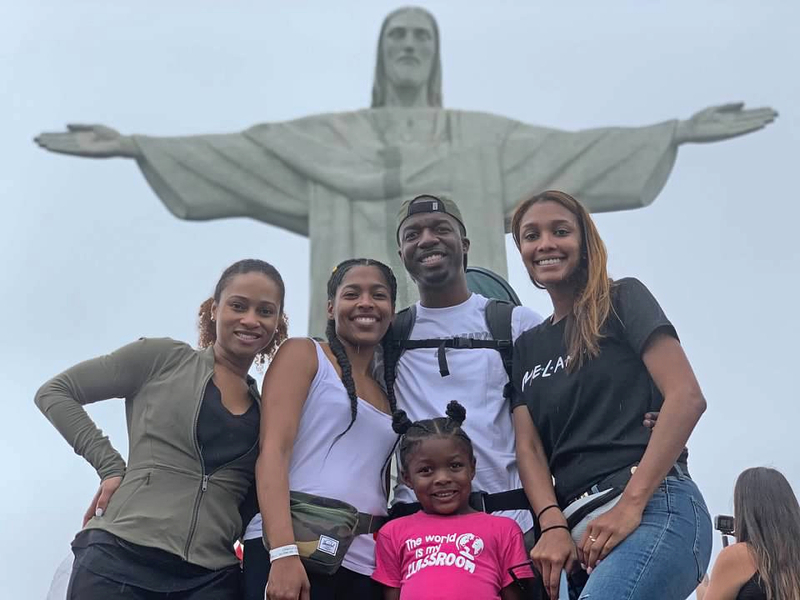 When we found the cheap flights to Brazil we were looking for a trip with specific dates as we’d be traveling for our daughters spring break. We used Skyscanner and entered in our home airport and travel dates and it showed us the cheapest places to go during that time. When the cheap flights to Brazil came up we were ecstatic! 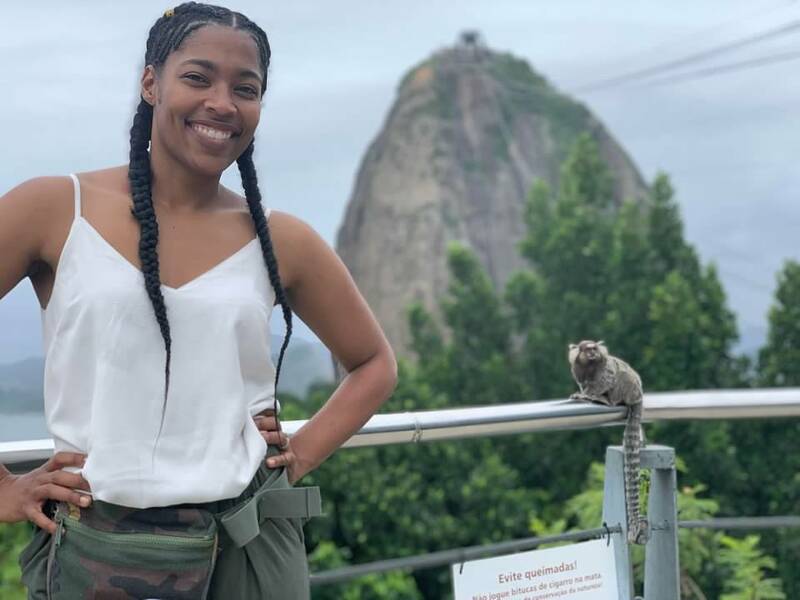 I couldn’t believe we were going on a Brazil vacation for only $340 per person. 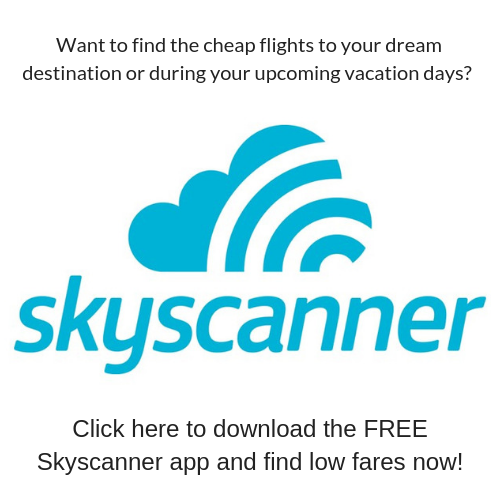 Skyscanner also has a free app to make it easier to search for deals on the go, download it here. My parents went to Brazil in February 2018 and had to jump through a lot of hoops to get the Brazil visa for US citizens. We were lucky that things changed and the Brazil visa for US citizens was now an e-visa. The process was simple, just apply here and pay $44 per person. You will receive your visa in a few days barring you upload correct and easy to read documents. If you’re going on your Brazil vacation after June 16th you don’t have to do anything. Starting June 17 there will be no required visa to go to Brazil for US citizens. When we went on our Brazil vacation there were no required vaccines for those traveling from the United States. Typhoid was recommended if you were traveling to rural areas, planned to drink tap water, or are an adventurous eater and would be eating a lot of street food. Just like we chose not to get this vaccines in Kenya because we planned to avoid these things we didn’t get it for our Brazil vacation either. 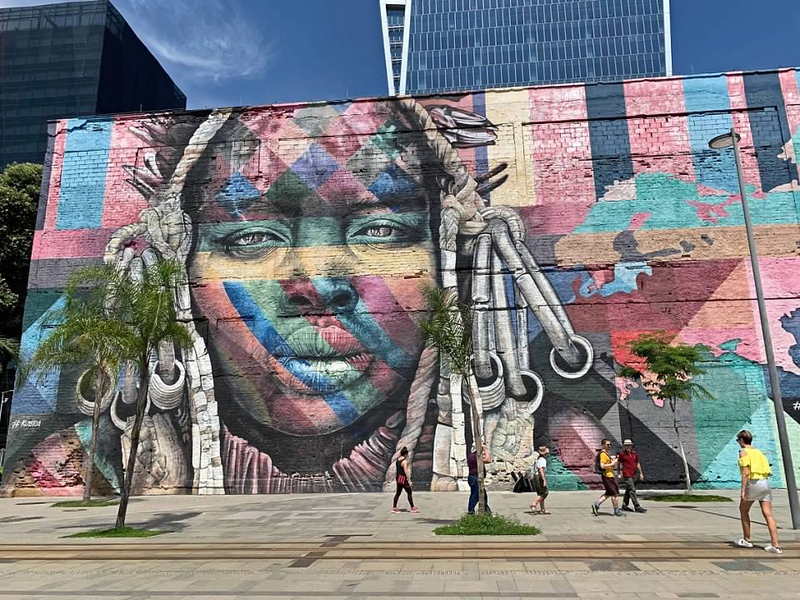 When planning your Brazil vacation where you stay can make or break your trip. 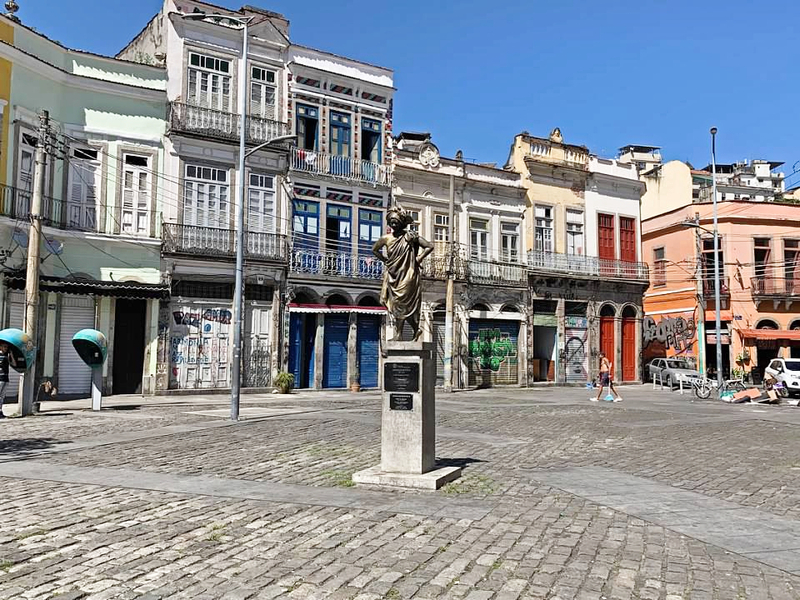 Based on our Rio de Janeiro itinerary we knew we wanted to be in the Copacabana area. It would make for a central base. Not only central through our research we knew it had a lot of restaurants in walking distance, was close to the beach and in a nice area. 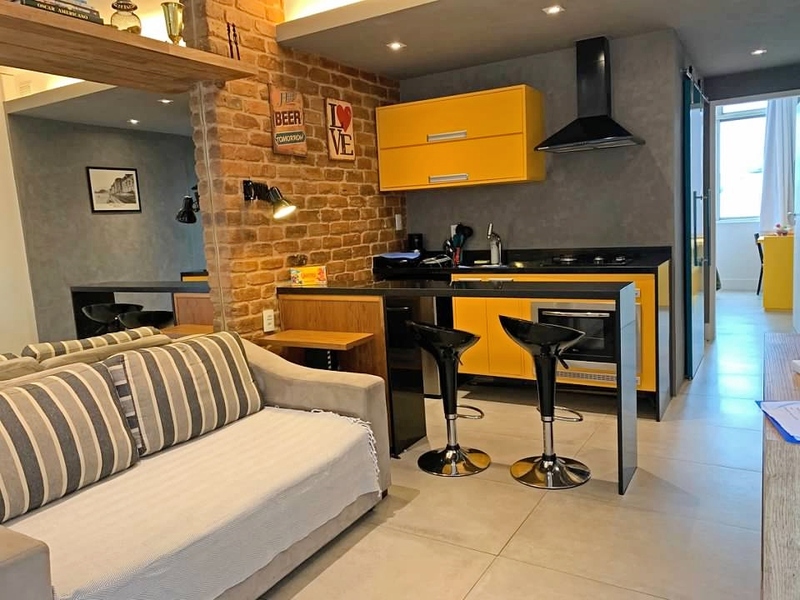 Even though we scored cheap flights to Brazil, we still wanted to save more money by renting an Airbnb. We booked this one bedroom apartment that had a pull out couch for the kids for $420 for 7 nights. It was a 5 minute walk to Copacabana beach and you could see the beach out of the bedroom window. Our host was very accommodating allowing us to check in early. He also provided towels (but no wash cloths so bring your own), and 3 bars of Dove soap. 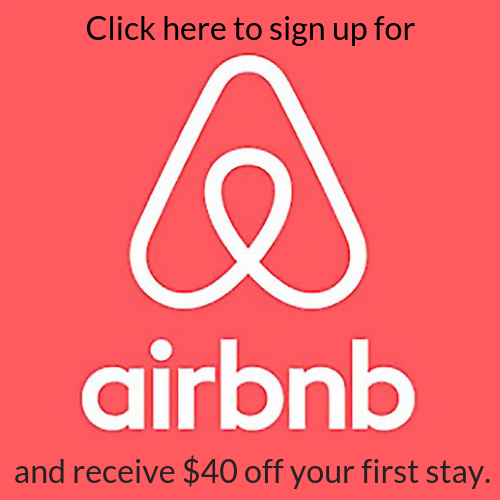 If you’ve never used Airbnb before, sign up here to save $40 on your first stay. Nervous about Airbnb? 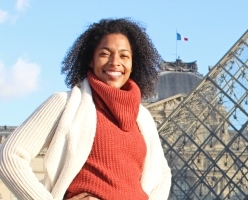 Don’t be, here are 8 tips to guarantee a great Airbnb experience. 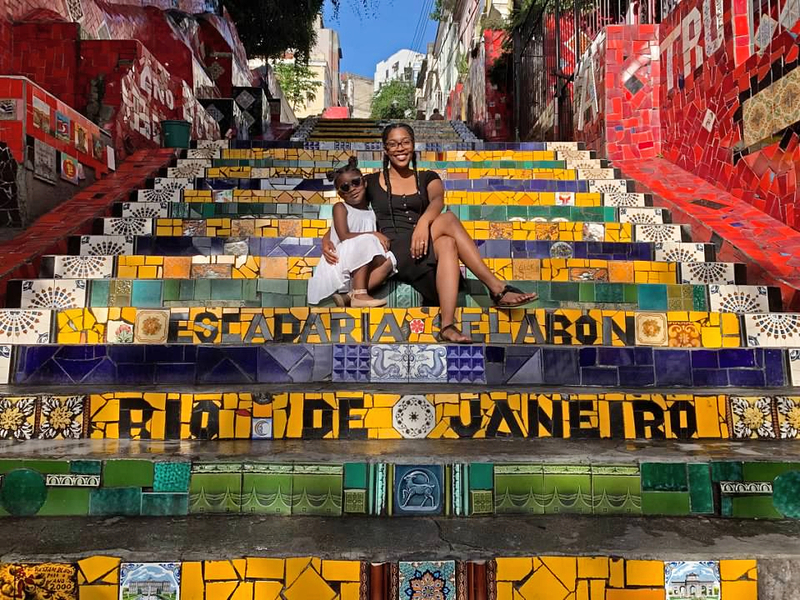 When planning our Rio de Janeiro itinerary like usual I thought about the things each member of our family likes to do. This ensures we each enjoy one must-do activity and then everything else majority wins. Another trip planning tip is to always put your destinations in Google Maps. This ensures you’re not backtracking when doing multiple activities in one day. It will just end up costing you time and money. To be completely transparent below is the itinerary I planned for each day based on my previous statement but it’s not the order we ended up doing everything in. This was due to poor weather on our first two days and a sick child on another. On our first day in Rio we conquered Christ the Redeemer which was our youngest daughters first Wonder of the World. It was cloudy day and it was raining on and off. While we didn’t get blue skies the crowds were minimal which worked in our favor. You can drive up to the statue or take the tram. We decided to take the tram as it’s a more scenic route. The tram tickets cost $18 per adult and both kids were free as there is no charge under 5 year old. You can buy them online or purchase when you arrive. We planned to visit Sugar Loaf Mountain after Christ the Redeemer but the rain began to come down pretty hard. I’m still listing it under day one because of the proximity of the two locations it just makes sense to visit them the same day. If you buy your tickets online you save 10% and children under 6 are free. Don’t worry about weather issues like we had as you can use your tickets within 4 days of the date you purchased them for. You will take two cable cars up to get to Sugar Loaf Mountain. The first stop on the cable car takes you to Pão de Açucar. Here you will have amazing views of Rio and be able to capture a photo with Sugar Loaf Mountain behind you. You can also take a 7-minute helicopter ride around Christ the Redeemer. We ended the day having the best dinner every at La Maison Restaurante on Copacabana Beach. Not one person was disappointed in their meal. The food was so good we actually ate here again on our last night. Check out our recommendations for the best restaurants in Rio, you won’t be disappointed. We started our second day of our Brazil vacation off with a visit to Jardim Botanico. The entry fee for adults is roughly $4 and children under seven are free. We really enjoyed the cactus exhibit, I never knew there were so many species. There is also a rose garden, Japanese garden, several waterfalls and we saw a ton of monkeys which the kids loved. Just a quick drive away is Parque Lage. Here you can have brunch or lunch at the cafe and enjoy the gorgeous views. There is no fee to enter the park. 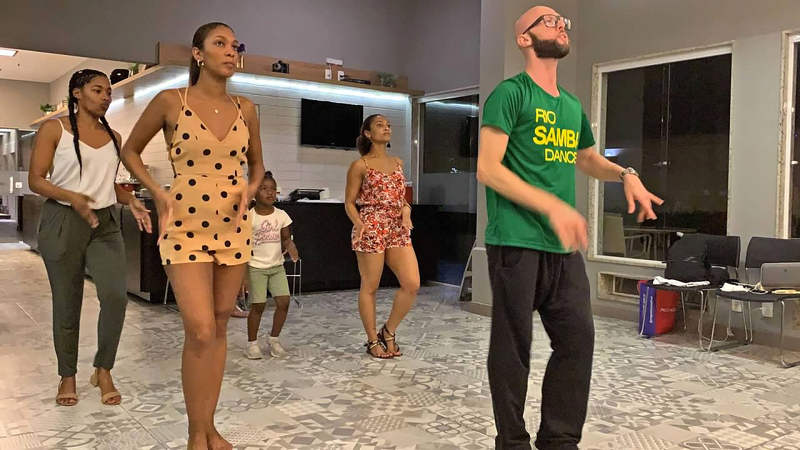 In the evening immerse yourself in the culture and take a Samba lesson. We decided on Rio Samba Dancer as they were only 1 of 2 schools we found that taught classes in English. We chose a one hour private lesson as it was only $6 more per adult and we had the kids. They did not charge us for the children but not sure what age they start charging kids. I wish they offered two hour lessons like when we took Salsa lessons in Cuba. Our class was great but I felt like as soon as we started to get the hang of things class was over. 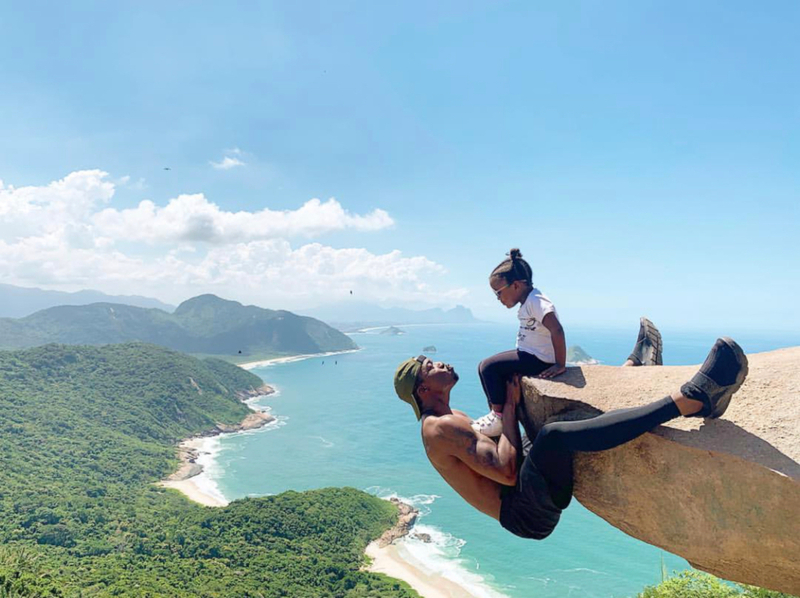 If you’ve ever seen the many photos circulating Instagram of people hanging off a cliff in Brazil and want to get those photos you’ll need to head to Pedra do Telégrafo. No need to worry though, the photo is an optical illusion and there is really a walkway underneath. Still the end result is pretty epic. Pedra do Telégrafo is a 90 minute drive from Rio followed by a 45 minute hike. You’ll want to arrive early or risk extremely long lines to take a photo. You can read more about how to get to the cliff and how to prepare for the hike here. After your morning hike what better way to cool off than an afternoon on the beach. On the way back to Rio from Pedra do Telegrafo you’ll pass several beaches. The first is Grumari Beach which is good for swimming. Next will be Prainha Beach which is where a lot of locals surf. Here there is a restaurant serving breakfast and lunch as well as vendors renting chairs and umbrellas. The last stretch of beaches before getting back into Rio proper is Macumba Beach. This beach also has a ton of restaurants and is good for both swimming and surfing. My eldest daughter loves to cook and since taking our first cooking class abroad on our trip to Costa Rica we’ve done one wherever possible. 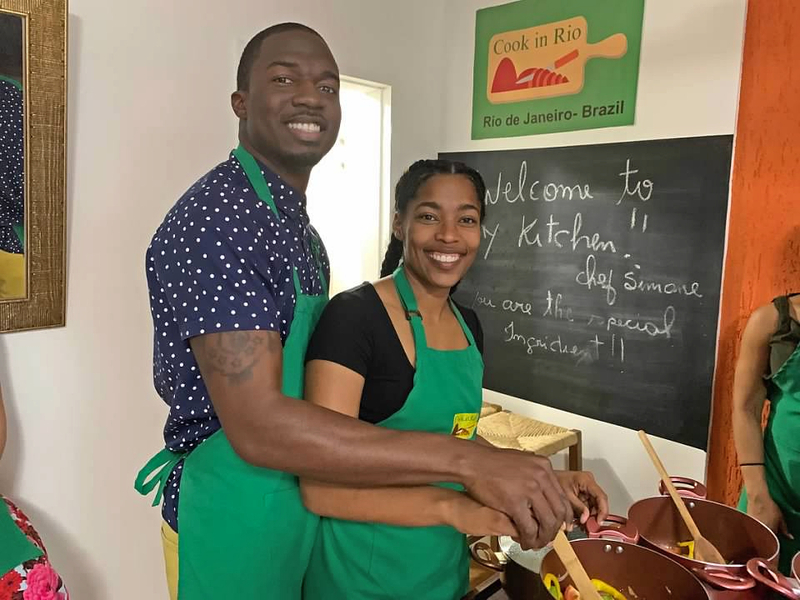 We heard Chef Simone was the best teacher in Brazil and booked a class at her Cook in Rio studio. Needless to say we were not disappointed. 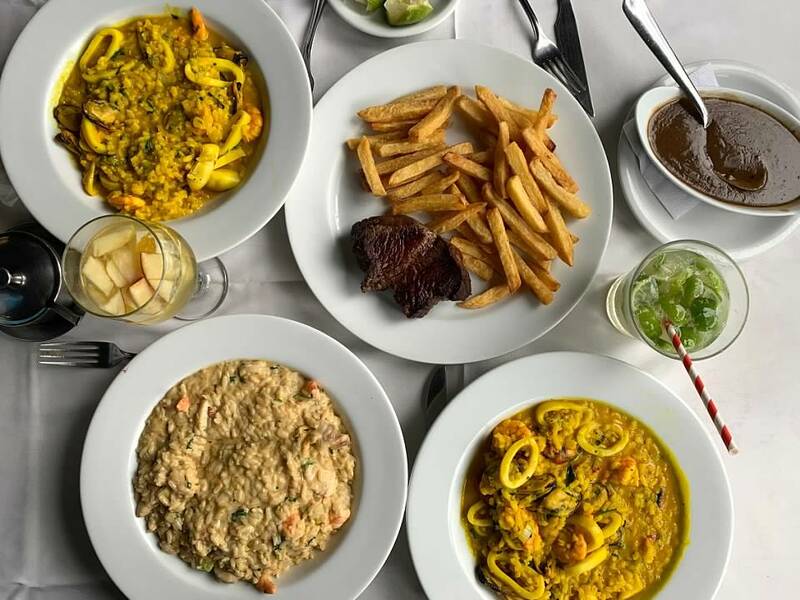 We made two appetizers, side dishes, the traditional Brazilian dish moqueca fish, and a dessert during our 3 hour class. After eating an amazing meal at Cook in Rio we went to experience one of the most energetic events in Rio after Carnival, a futbol match. 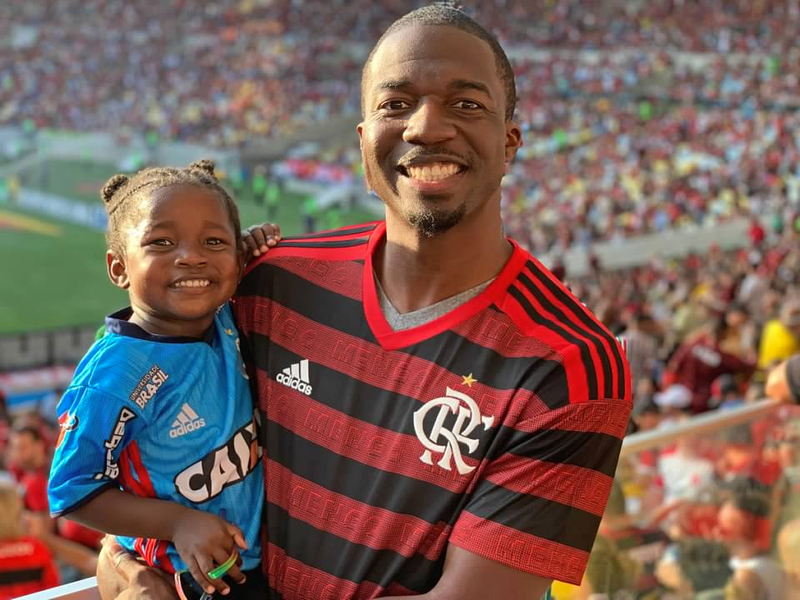 We were blessed to be able to see the two biggest Brazilian teams compete, Flamengo vs. Fluminense. Being in Maracanã was a feeling like no other. We aren’t even big futbol fans but it was one of the best experiences we had on our Brazil vacation. I highly recommend going to a match if there are any teams playing during your trip. If you’ve seen the pretty tiled staircase or steps in people’s photos from their Brazil vacations their called the Escadaria Selaron. As you can imagine this place is pretty popular and if you arrive in the afternoon you will have to stand on a line. You’ll also most likely have a ton of people standing in the background of your picture. If you want pictures alone I recommend getting here at 8AM. 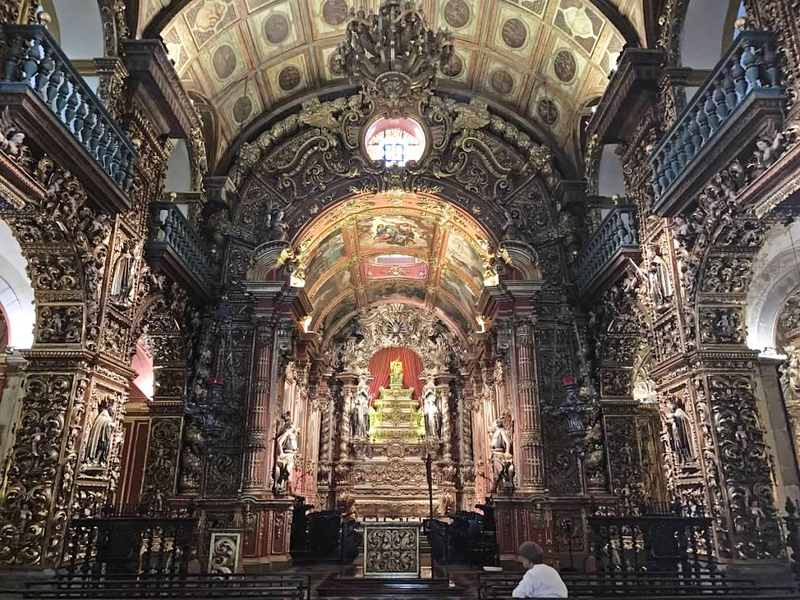 After visiting Escadaria we visited one of the most famous cathedrals in Rio, the Cathedral of St. Sebastian of Rio de Janeiro. 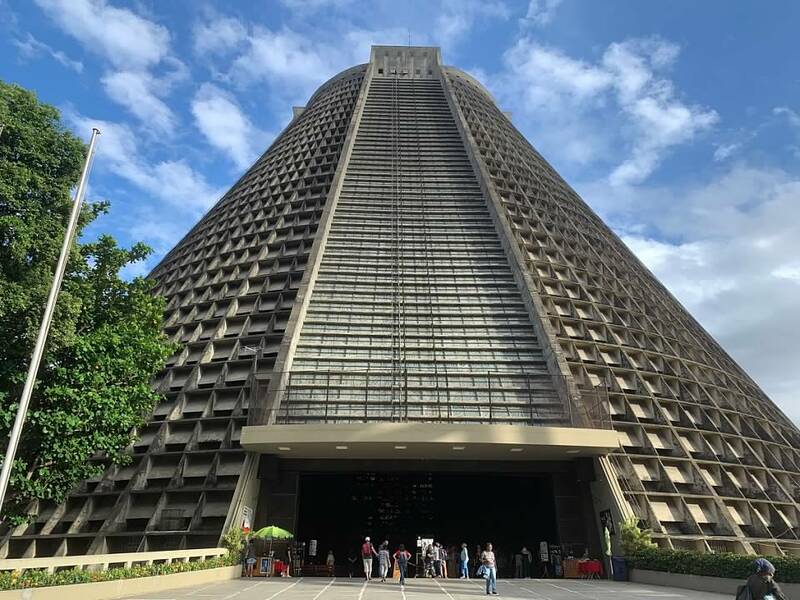 The outside of the building is like no other cathedral in the world. Inside the stained glass work is beautiful! Also in the area is Mosteiro de Sao Bento. The outside is beautiful but the inside will leave you speechless. There is so much effort that went into the details of everything inside, pictures don’t do it justice at all! We’d been doing a lot of walking on our Brazil vacation and it was time to relax! I found a spa, Lavanda Fitness Spa, that not only allowed children but offered kids packages. The girls got manis, pedis, a facial and the cutest kids massages ever. I got a massage and facial while my husband got a massage. 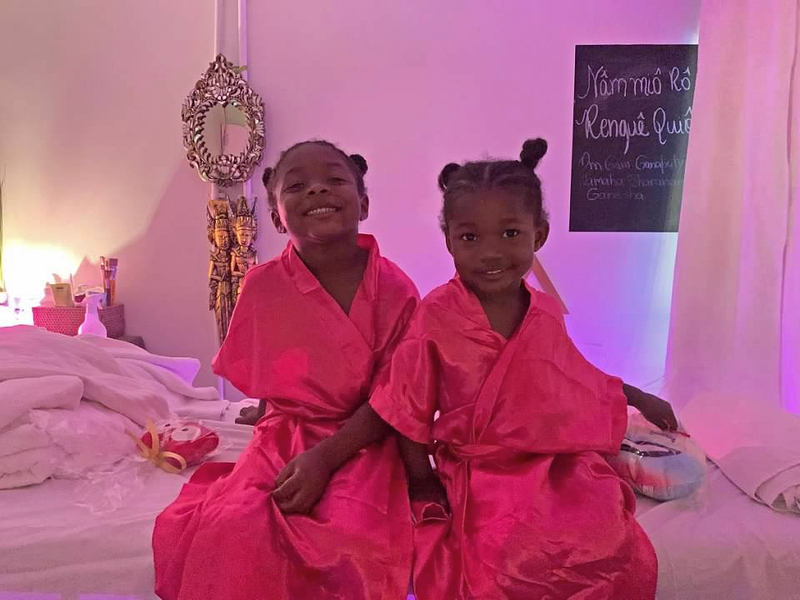 When we left the girls said “Oh mommy now we know why you like to go to the spa!” We may have created little spa monsters! Our plan was to take a day trip to Ilha Grande. The island which is a two hour drive followed by a one hour boat ride is known for its pristine waters. There are opportunities to snorkel with sea turtles, scuba dive, and do waterfall rapeling. You can also relax on secluded beaches, kayak, or party on a catamaran. Unfortunately we didn’t get to do this as one of our daughters wasn’t feeling that well. 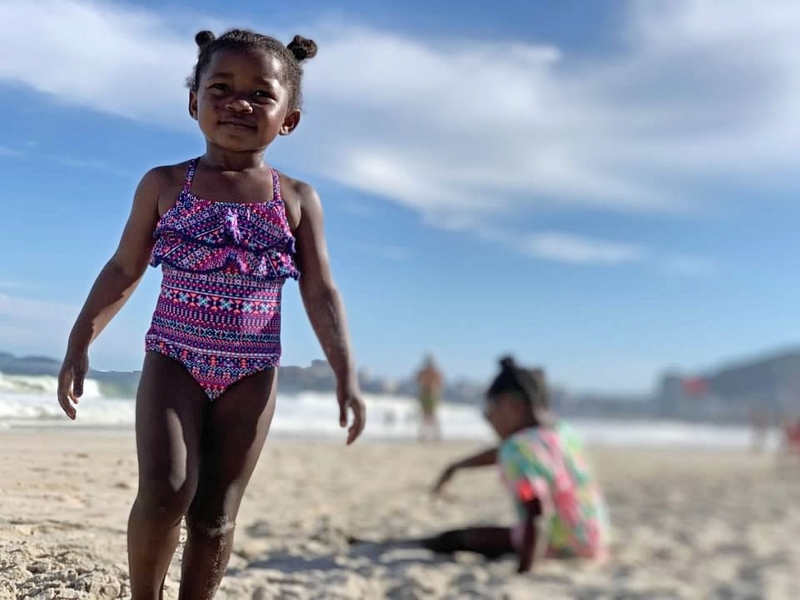 We thought avoiding the long travel day would be best and instead spent the day at Copacabana Beach which was a 5 minute walk from our Airbnb. Here are tips on traveling with a sick child. 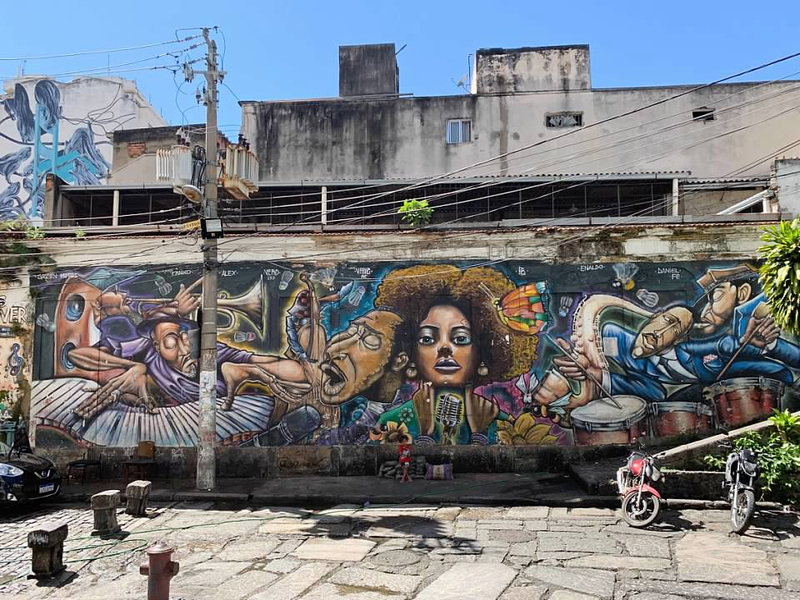 It was the last day of our Brazil vacation and we couldn’t leave without going on an Afro-Brazilian history tour. 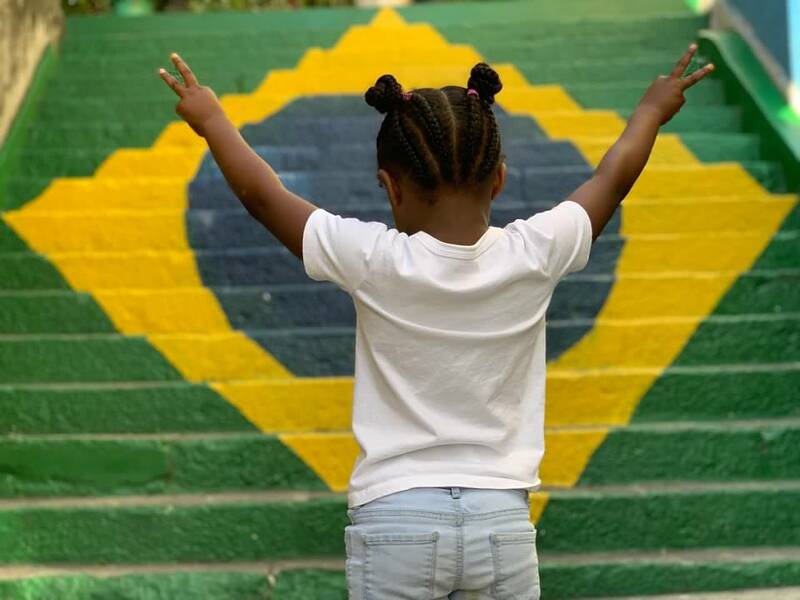 Brazil has the largest population of black people outside of Africa. This is because out of the 12 million slaves brought to the Americas from Africa, 4-5 million of them ended their journey in Brazil. We booked our tour though Airbnb Experiences. It was our first time using Airbnb for a tour and it was a seamless process. The tour was much more affordable than any other online booking site. I loved that we were able to support a small business, knowing the money was going straight to a local Brazilian (besides the Airbnb fee of course). The artwork in Little Africa is gorgeous and was one of the highlights for me, besides the rich history of course. It was our last day and with an early flight in the morning we just wanted to relax so we spent the afternoon at Copacabana beach. Spoiler alert: I did not like Copacabana Beach. While it is the most famous beach in Rio we found it to be very dirty with trash, cigarette buds and other sharp objects extremely visible throughout the sand. To make matters worse the beach water didn’t look good at all with tons of brown bubbles. It was too late to go to a different beach so we just relaxed under our umbrellas and soaked up the sun. When planning our Brazil vacation we looked in to the easiest way to get around Rio de Janeiro. Our options were to rent a car, take a taxi/uber, hire a driver, or take public transportation. While I drove myself around Tulum on my solo trip Rio was much larger and I heard parking could be cumbersome so we decided renting a car wasn’t the best option. We are typically ok with using public transportation like we did in Chicago, Rome, Amsterdam and Bangkok but heard very few people spoke English (rightfully so) and we didn’t want to chance getting extremely lost.We ended up using a mix of a private driver and taxis and Ubers. Someone recommended a driver they have used on their previous trips, Mr. Aldiney. When I contacted him through WhatsApp prior to our trip he was very responsive and provided a lot of good information to help us plan our trip. He agreed to pick us up from the airport and wait right outside the exit where we could easily find him. When we arrived in Rio he was on time and had a clean 7 passenger vehicle with WiFi. At the time of our trip he charged a flat rate of 80 Reais (roughly $20) per hour for up to 4 passengers or 100 for 5-6 passengers. His English is great, he was always early and he also served as a translator for us. He is also the one who purchased our tickets for the futbol match ahead of time. You can WhatsApp him at +55 21 99156-6486. While we loved Mr. Aldiney you need to decide when you really need him. Every minute he is with you he charges his fee. For some instances it was really nice to have him with us as he he holds a degree in Brazilian history and more so served as a tour guide. However at certain places we didn’t need a tour guide and it was a waste to have him be with us while we explored. For these instances it probably would have been cheaper to just get a taxi or Uber which we eventually did towards the end of the trip. Places like the Botanical Gardens, Parque Lage and Pedra do Telegrafo you really don’t need him to wait. You can see if he will just drop you off and then come back at an agreed upon time. Do not, I repeat do not exchange money at the airport. When we arrived at GIG airport there were several currency exchange offices fighting over our business. We checked our currency exchange app and it said $1= 3.9 Reais. However, these offices were only offering us 3.3 Reais per USD. When we got to our Airbnb there were several currency exchange offices and the first one we walked into offered us an exchange rate of $1 to 3.7 Reais and no transaction fee. 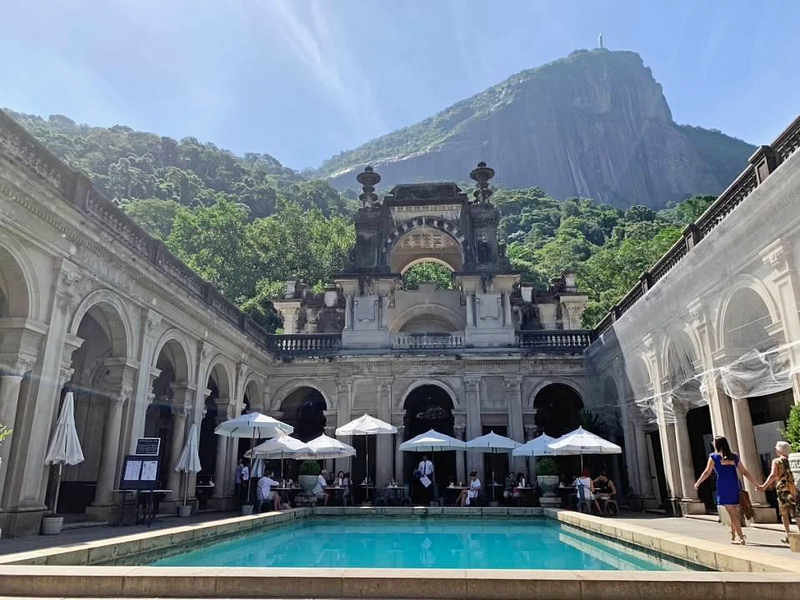 Even with some hiccups our Rio de Janeiro itinerary was everything we dreamed of. 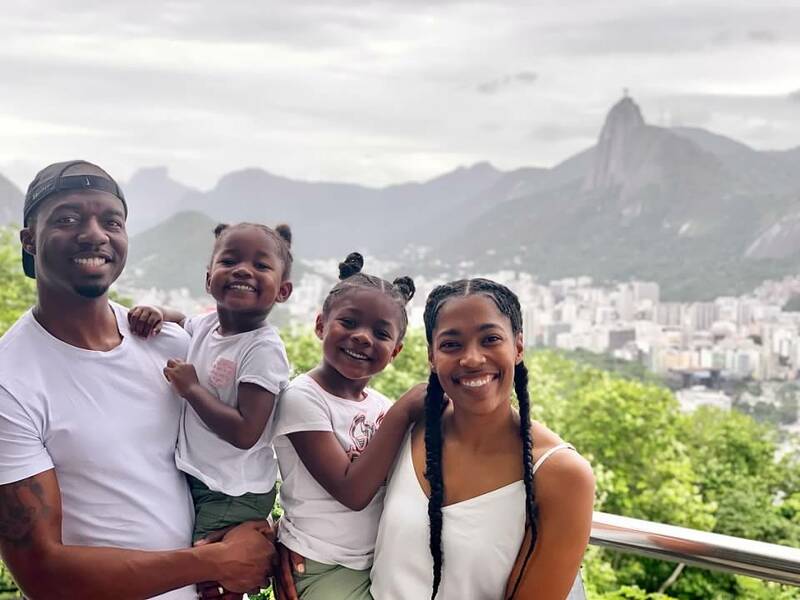 We had the most amazing Brazil vacation and we can’t wait to return to explore more of the country. Thankfully with no need for a Brazil visa for US citizens it will be even easier next time. Did you find this article helpful? Please share it! Till’ we meet again Brazil. This was a very inspiring post! I can’t wait for the opportunity to take my husband and 3 boys to Brazil! Thanks so much for sharing! You have such a beautiful family! Yes, Yes, and MORE Yes! Love how you’ve highlighted all of the family friendly things to do… definitely adding this to our destination list. Beautiful photos. Great details.